Braintree and Brockton, MA (December 18, 2017) – Howard House, a Veteran’s Supportive Housing community managed by Peabody Properties, a full-service real estate and property management firm, was the site of a recent event facilitated by iPods for Wounded Veterans, an organization that since 2011 has brought thousands of electronics and gifts to badly injured members of the U.S. military who served in the Kuwait, Iraq and Afghanistan Wars and are now recovering at military hospitals. Eight residents of Howard House, located on the grounds of the Brockton Veterans Administration Medical Center, attended the event and welcomed donations including t-shirts, sweatshirts, magazines, gift bags, socks, hats, gloves and candy. The veterans also received hand-written cards from students at Wilmington Public Schools; the students created two colorful banners now gracing the common basement area at Howard House. 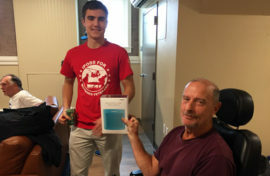 In addition to providing gifts, iPods for Wounded Veterans raffled off several tablets and other electronic items to Howard House residents; gift bags were set aside for those residents unable to attend the event. By offering to hold this event, iPods for Wounded Veterans graciously included Howard House in their generous undertaking, even though not all residents are badly injured members of the U.S. military who served in Kuwait, Iraq or Afghanistan. Howard House residents have served in various U.S. military conflicts, and are formerly homeless veterans or veterans at risk of being homeless. For more information, or to support iPods for Wounded Veterans, please visit http://ipodsforwoundedveterans.org/.